When you call Accents In Cleaning (AIC) to your home, you should expect magnificent cleaning services. This is only achievable because we know what we are doing every step of the way. In this blog post, we’ll expose you to some of our techniques. Some of which you can replicate at home while some, uh, you just can’t. But not to worry, you’ll be better educated than you were before reading this post. Before beginning, the Accents in Cleaning employee will walk through the home with the client to discuss areas in need of attention. The first cleaning step is a deep vacuum with our high-quality machines. These vacuums will pick up debris most commercial machines will not. This is not to say you should not vacuum before our visit since regular vacuuming is good for the life of the carpet and your personal health. Next, stains and spots are targeted as needed with the correct products and methods. In the rare case that the spot is not removed or improved, our cleaners will inform the client. We then use a pre-spray before bringing in our truck mounted cleaning machines using a one wet, two dry processes for a high quality clean and low drying time. We offer a speed drying system, and while it completes our professionals will clean up their gear and discuss with you what was done, payment, and give you the option to schedule your next cleaning. Our technicians begin cleaning by a pre-vacuum at which point we keep an eye out for any damage present to the furniture before our arrival. The furniture is pre-sprayed and a coarse hair brush is used against the upholstery to loosen up any grime to ease the cleaning process. Our truck mounted system ensures high heat and quality clean to remove deeply embedded soils. Upon completion of the cleaning, the brush is used again to restore the original texture of thick fabrics and speed the drying. Much like with our carpet cleaning, we offer a speed-dry system. Before beginning, the area is inspected to know where would need the most attention and which products will best clean the area while maintaining the integrity of the tile and grout (since we offer cleaning for man-made and natural flooring). The floor is prepped with our tile cleaning solution. Grout lines are manually scrubbed to ensure the dirt and grime is removed. Using our special made tile tool to clean the corners effectively we ensure a full clean without damaging the tile or furnishing. Our high-impact spinner deeply cleans every pore and grout line to ensure the best clean possible. Before finishing, we ensure all moisture in the surrounding area is dried and we apply a high-quality clear sealant before finishing with our rotary machine to restore the shine and luster of your tile. As with our other services, the floors are dried with our speed-driers. 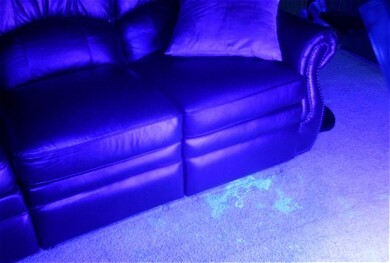 Pet stains are hard to see with the naked eye, but we use blacklights and various technologies to find and mark these spots and use our in-house urine treatment product to remove the stain and odor. We ensure the even spread of the product and use a subsurface tool to completely remove the soil and product before using a deodorizing product and our standard truck-mounted cleaning system. At Accents in Cleaning we understand the value of clean, well-kept floors and we hope you choose us for your annual, semi-annual, or random floor cleaning needs! Help! How do I deal with Pet Odors?